…for full instructions on how to knit, check out my DVD on How to Knit. 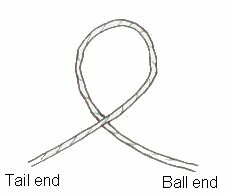 With this method of casting on, the stitches are created from the tail of the yarn, consequently you need to allow a long enough tail to make all the stitches you need before you start. As a ‘rule of thumb’ I would suggest you allow at least ½” per stitch + 6″ for sewing in. You will need a longer tail with thicker yarn. 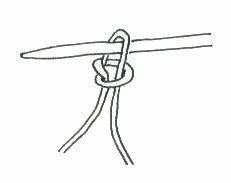 Start by making a slip-knot in the yarn made so that the tail end tightens the knot of the stitch and the ball end tightens the loop that is the stitch itself. Place this loop on the right hand knitting needle with the tail of the yarn to your left and the ball to your right. Holding the needle in your right hand, pick up the strands of yarn with your left hand. 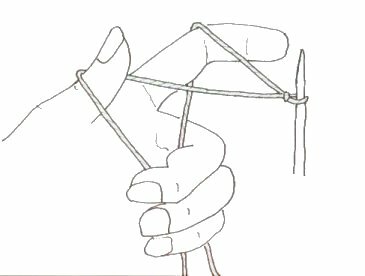 Place your left thumb between the two strands of yarn from behind so that the tail passes between your thumb and first finger. Bring your thumb back towards you, catching the tail end of the yarn behind your thumb. Hold the loose tail end under the third and fourth fingers of your left hand to give a little tension. Meanwhile lift your left hand, first finger to pick up the ball end of the yarn and catch the loose ball end under your 2nd finger and gather both loose ends firmly into the palm of your left hand. Once you are holding the yarn correctly, making the stitches is very quick and easy. With the point of the knitting needle, go up under the loop of yarn that is nearest to your body. Carry that loop over the lower thumb loop and over the upper finger loop and catch the upper finger loop coming back towards your body. Hook this loop through the gap by your thumb and allow the yarn on your thumb to drop off. Pick the yarn back up with your thumb, tightening the stitch that you just made and setting up for the next stitch. You have just cast on your second stitch! 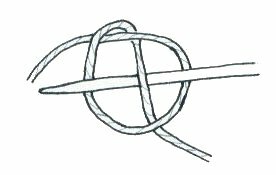 (The first stitch was the slip knot). Repeat this step until you have cast on the desired number of stitches on the right hand needle. Points to watch. 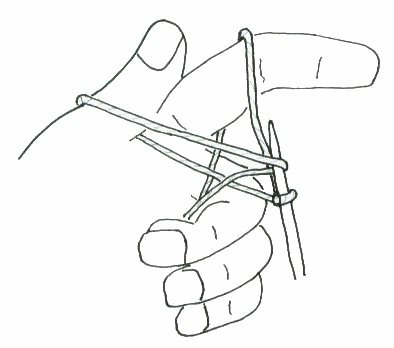 The tail end of the yarn that is over your thumb will tend to untwist because you are holding it in the palm of your hand. You will need to release it and allow it to retwist after every few stitches.